How's everyone doing with the basics? Still following along and learning new things? I do hope that everything has made sense so far. If you have questions, just ask, and I'll do my best to reply in the comments. 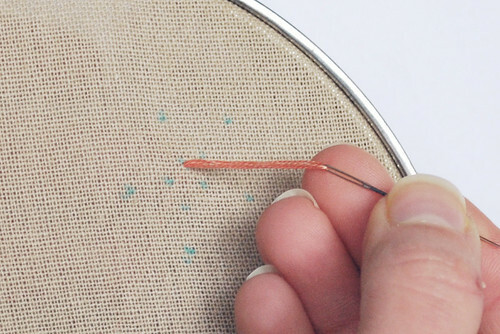 And if you're just discovering the series, be sure to go through all of the Embroidery Basics posts. There's lots of info already, and plenty more to come in the next month! 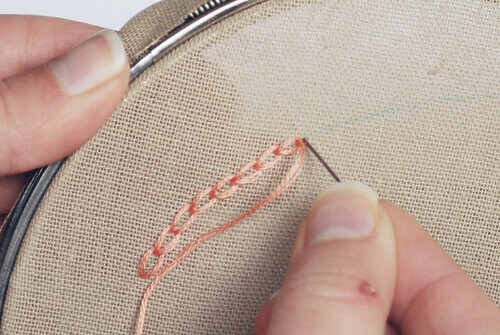 Today we're talking about chain stitches. Like the chains in crochet, these didn't come quickly for me. I still don't use the regular chain stitch too often, as it creates a relatively thick line, and I like to work small. But it is a beautiful thing when you are able to use it. Ready? Come up from the back. 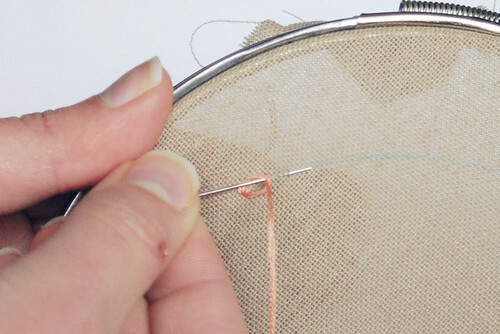 Insert the needle just next to where you came up, then (using the sewing method) come back up a stitch length away. 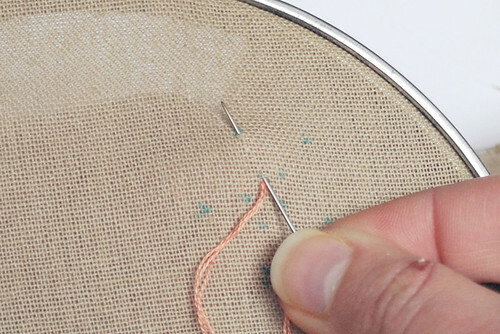 Make sure that the loose thread gets looped around your needle that is coming up, and pull the thread. You don't want to pull it too tight, unless you want it look and straight and stretched. Traditionally, the stitches look a bit round...like a chain link. Insert the needle just next to where the last stitch came up, and again, come back up. 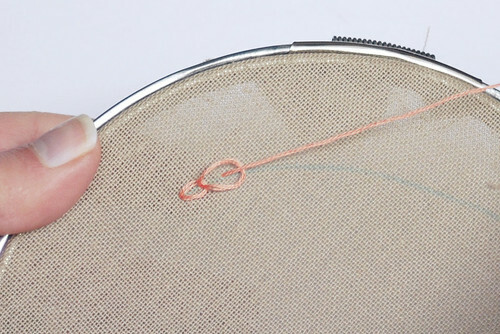 When you are ready to end a line of chain stitches, instead of inserting your needle next to where you came up, insert it on the other side of the loop of floss. You'll have a nice little chain. One thing to watch for is twisty floss. It can make your chains frustrating, so try to let your needle/floss hang and untwist every so often. Why, yes, Olive! 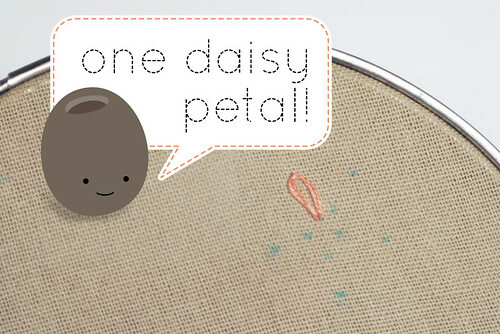 It is most often called a lazy daisy stitch! I like that name better, but the thing is, there are ways to change the stitch so that it no longer resembles a daisy petal. Detached chain is a less confusing name in those cases. Either way, this is a great stitch. Today, I'll show the basic daisy petal type of detached chain. 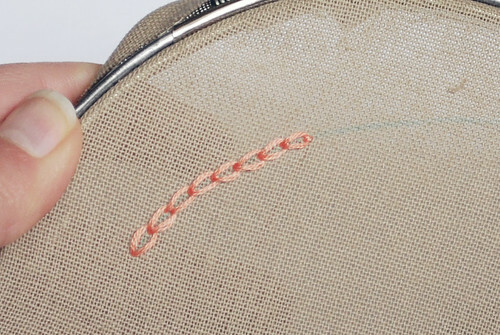 Patterns may mark this stitch differently, and often they show the entire outline shape of the stitch. For my practice, I've marked it with two dots for each stitch. One is at the point, and the other is at the rounded part. Come up where the point of the petal will be. Like with the regular chain, insert the needle just next to where you came up. Using the sewing method, you'll come back up where the rounded part of the petal will be. Be sure to loop the floss around your needle, and gently pull the floss. 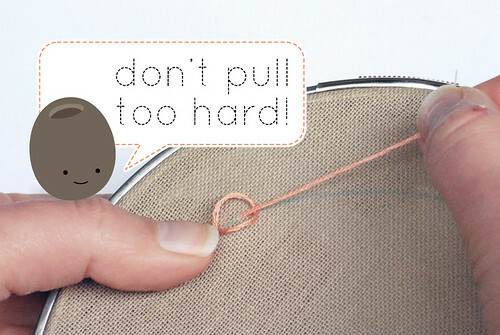 Remember, you want it to have a nice rounded shape, and you can alter the shape by how loose you keep the loop. Just as you finished off the regular chain, insert the needle on the other side of the loop to finish off the detached chain. Do this for each lazy daisy, and you'll have a nice little flower. (Probably nicer than this one...my points aren't quite close enough together!) Or you can make them all go the same direction and use them for raindrops. Next time around, we'll stitch up some faces, and I'll show you how you can change up the detached chain for a sweet little smile! Download the PDF lesson for chain stitches. 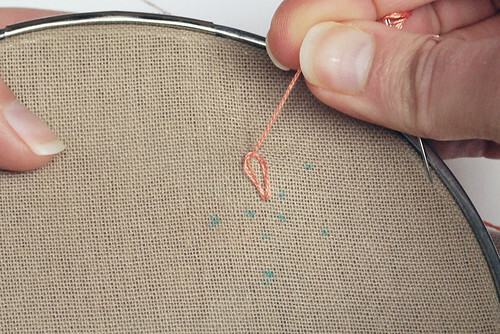 I don't have a pattern for this lesson, but I do have a fun way to use the chain stitch. 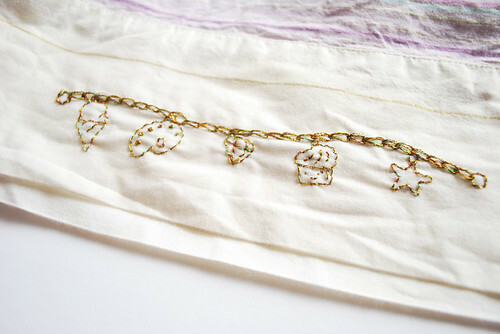 Last year, I stitched a charm bracelet, and the chain stitch was the base for it! Find the instructions here. 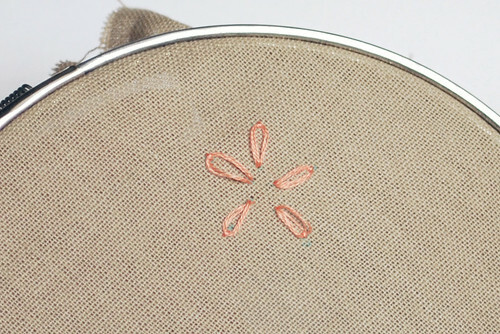 One thing...if you're new to embroidery, I wouldn't recommend using metallic thread just yet. Get comfortable with the regular kind first. you are so awesome to be doing these tutorials! I'd just like to say thank you for creating the embroidery basics tutorials - and especially for posting such clean and professional looking PDFs of the tutorials! 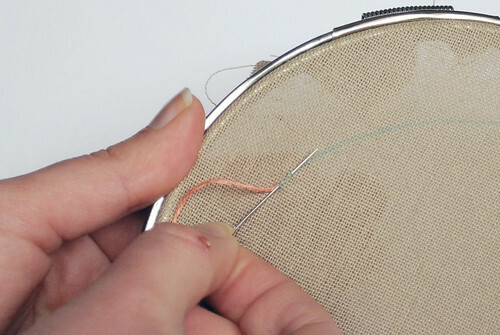 They are really, really helpful and I'm enjoying learning to embroider with your series! Thanks again! I second what Sarah Louise said! thanks so much! Eeek, lots of practice needed for me, I tend to pull too much :) Thanks for sharing these tutorials, very helpful! Thank you so much for this post. I want to let you know that I posted a link to your blog in CBH Digital Scrapbooking Freebies, under the Page 4 post on Apr. 29, 2011. Thanks again. Little Olive, I had the funniest dream last night! It involved trying and failing to make a chain stitch. But I was able to turn it into some other stitch. Maybe I shouldn't read craft blogs before bed. Haha YES here's the chain stitch (used on my advent calendar) and I agree, much better than the split stitch. and so useful!